SEATTLE – Sparks will fly and heads will roll in Seattle Opera’s tale of English royalty, Mary Stuart, coming to McCaw Hall for the first time this winter. Composed by Gaetano Donizetti, Mary Stuart depicts a fictitious confrontation between two historic rulers told with searing emotions, extravagant period costumes, and virtuosic bel canto singing. 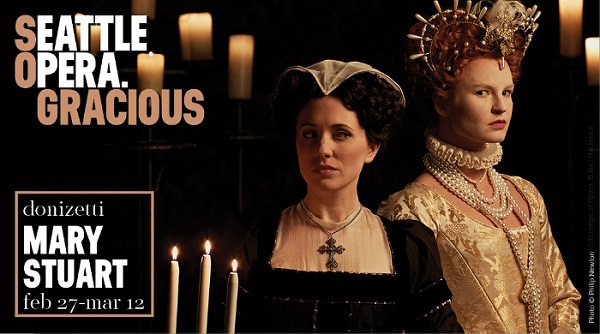 The story dramatizes the conflict between Mary, Queen of Scots and her jealous cousin Elizabeth I, who resents Mary’s popularity, Catholic faith, and her position as the next in line to inherit the throne of England. As the opera speeds toward its powerful conclusion, Elizabeth resolves to eliminate her rival, while Mary discovers the strength to embrace her own dark fate. Pre-performance activities in the lobby will help attendees connect more deeply with the characters, composer, and history of these monarchs, and will ensure an unforgettable experience from the moment patrons walk through the front door. “I am delighted that Seattle Opera is presenting Mary Stuart for the first time in its history, for it is long overdue,” said General Director Aidan Lang. Following its 1835 premiere, Mary Stuart was initially considered too controversial by authorities, which led to its ban and neglect for more than 100 years. A performance in Donizetti’s hometown of Bergamo re-introduced the piece into operatic repertoire, where it has grown in popularity ever since. Today, the opera is valued both for its music—some of Donizetti’s best—and its compelling drama of powerful women in conflict. In the role of the Catholic queen of Scotland are two singers making Seattle Opera debuts: Serena Farnocchia and Joyce El-Khoury. Italian soprano Farnocchia has gained fans in the great opera houses of Europe, as well as in Asia. Lebanese-Canadian El-Khoury continues to make a name for herself as a rising star at the Metropolitan Opera. Two American sopranos sing Elizabeth, the Protestant queen of England. Mary Elizabeth Williams returns to Seattle following her portrayal of the leading lady in Tosca (2015) and Abigaille in Nabucco (2015), and Keri Alkema, an artist who’s been highly praised for her “incisive musicality” (New York Times) makes her company debut. In the role of Leicester, the appealing nobleman loved by both Elizabeth and Mary, is John Tessier, who returns to Seattle following his role as Nadir in this fall’s The Pearl Fishers (2015); as well as Andrew Owens, winner of the 2015 Francisco Viñas International Singing Competition, who makes both his company and role debut. Mary Stuart also sees the return of two celebrated Seattle artists: Weston Hurt as Talbot, who most recently performed the title character in Nabucco (2015) and Michael Todd Simpson, who was John Sorel in The Consul (2014). Renée Rapier makes her company debut as Hannah, companion to the Queen of Scotts in her imprisonment. Kevin Newbury, a Grammy-Award-nominated opera, theater, and film director, makes his Seattle Opera debut as stage director, and maestro Carlo Montanaro returns to the podium following Nabucco (2015). Seattle native Jessica Jahn makes her company debut as costume designer. Mary Stuart premieres Saturday, Feb. 27, and runs through Saturday, March 12. Tickets are available online at seattleopera.org or by calling 206.389.7676 or 800.426.1619. Tickets may also be purchased at the box office by visiting 1020 John Street (two blocks west of Fairview), Monday-Friday between 9 a.m. and 3 p.m. Ticket prices start at $25. Groups save 15 percent: 206.676.5588 or groups@seattleopera.org. Seattle Opera Ticket Office: 206.389.7676/800.426.1619. In February, Seattle Opera offers free public-preview talks on Mary Stuart at libraries throughout the Puget Sound. For a full list, go to seattleopera.org/calendar. Evening performances begin at 7:30 p.m., matinee at 2:00 p.m.
Mary Elizabeth Williams and Michael Todd Simpson are former Seattle Opera Young Artists. Mary Elizabeth Williams won a Seattle Opera Artist of the Year Award. Production sponsors: Tagney Jones Family Fund at Seattle Foundation and Lenore M. Hanauer. 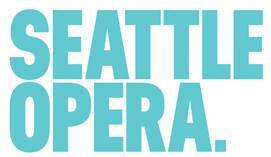 Seattle Opera is a leading opera company, recognized both in the United States and around the world. The company is committed to advancing the cultural life in the Pacific Northwest with performances of the highest caliber, and through innovative education and community programs that take opera far beyond the McCaw Hall stage. Each year, more than 95,000 people attend Seattle Opera performances and the company’s programs serve more than 400,000 people of all ages (including school performances, radio broadcasts and community engagement initiatives). Seattle Opera is especially known for its acclaimed works in the Richard Wagner canon, and has created an “international attraction” in its presentation of Wagner’s epic Ring, according to The New York Times. Connect with Seattle Opera on Facebook, Twitter, SoundCloud and through the Seattle Opera channel on Classical King FM. 98.1. Questa voce è stata pubblicata in Dal mondo della musica e contrassegnata con Aidan Lang, Andrew Owens, Carlo Montanaro, Gaetano Donizetti, Jessica Jahn, John Tessier, Joyce El-Khoury, Keri Alkema, Kevin Newbury, Mary Elizabeth Williams, Mary Stuart, McCaw Hall, Michael Todd Simpson, Renée Rapier, Seattle Opera, Serena Farnocchia, Weston Hurt. Contrassegna il permalink.